We tested the Mitsubishi Outlander Plug-in Hybrid Electric Car Model (PHEV) in the circuit Mobara, Japan. This four-wheel drive SUV hybrid technology with two electric motors, each of which drives the front wheels and the rear wheels. 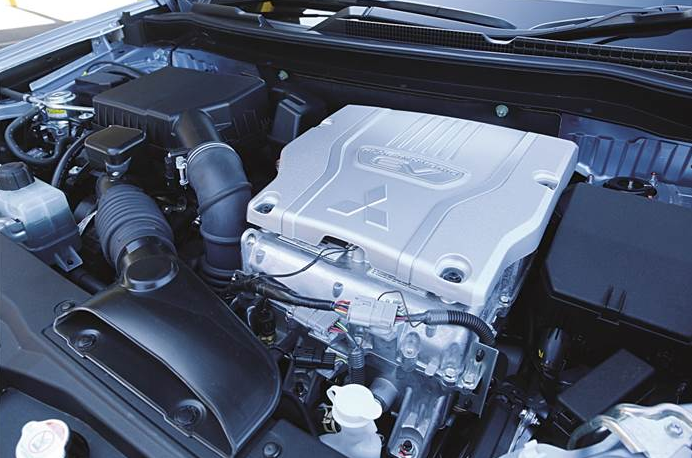 The Outlander PHEV gasoline engine 2.0-liter DOHC MIVEC technology that produces a peak power of 121 hp at 4500 rpm and torque of 190 Nm at 4,500 rpm, which is combined with two electric motors. Both the electric motor to generate power 82 hp, but the torque difference between the two. Front electric motor produces 137 Nm of torque, while the rear electric motor 195 Nm. Both the electric motor energy supplied by lithium-ion battery capacity of 12 kWh. There are three driving modes on this Outlander PHE. The first is the EV Drive Mode, which means the car only run using electric power alone, without the help of the gasoline engine. The second is a Series Hybrid Mode. In this hybrid mode, the gasoline engine operates as a generator that supplies power to the electric motor. The system switches to this mode when the charge remaining in the battery falls below a predetermined level or when the need to accelerate faster, as would precede a vehicle or climbing steep roads. And the third is the driving mode Parallel Hybrid Mode. 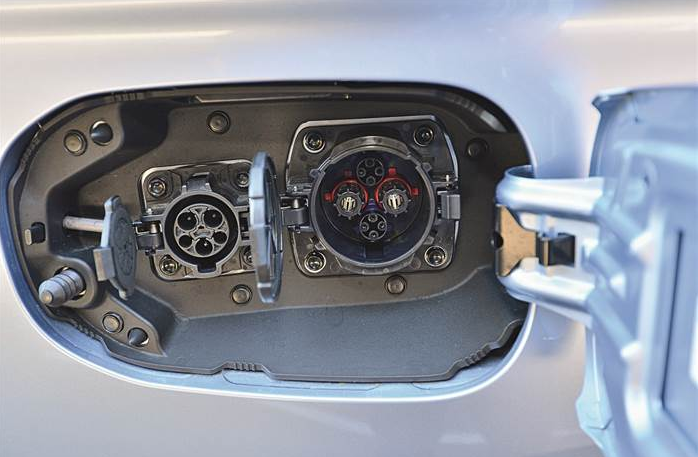 PHEV system will switch to parallel hybrid mode when the vehicle is running at high speed. In this mode the gasoline engine works in parallel with the electric motor, in order to produce great power. 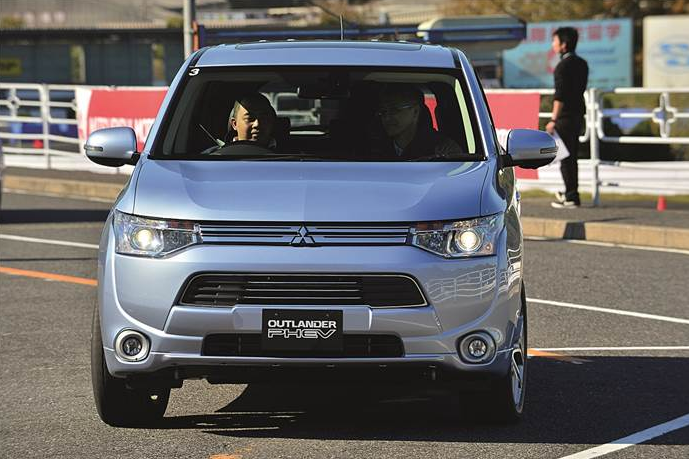 From the results of the testing in Japan, the results of the Outlander PHEV fuel consumption by EV Drive Mode mode to a distance of 60.2 miles, from the condition of full battery until exhausted. In series and parallel hybrid mode fuel consumption obtained 18.6 kpl. Meanwhile, if the fuel tank is filled full of 45 liters, the total mileage that can be achieved is 897 km. 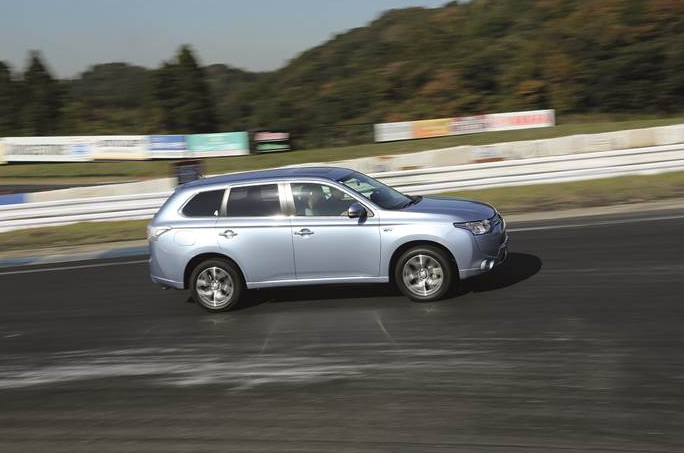 When we test at the Circuit Mobara, Japan, Outlander PHEV feels agile bulldoze every corner. Stability is no doubt partly due to the motion system of four S-AWC (Super All Wheel Control), in collaboration with Active Yaw Control (ayg), Active Stability and Traction Control (ASC) provide and maintain traction torque distribution perfectly. We also briefly examine the Regenerative Braking System module, wherein when the car decelerates, without the need to touch the brake pedal, the engine will charge its batteries. Regenerative Braking System is highly recommended used when the car passes a declining path. The way is to move the gear lever from position D to position B, it will display the number B0-B5. Figures here show the power of the braking power, which means no brake B0, while B5 with maximum braking means. Changes in the transmission is done via paddle shift behind the steering wheel. Aside from being a supporter of control, S-AWC is also one of the safety features found on Outlander PHEV. In addition there is also braking system with ABS, EBD and BA, SRS airbags and 'e-assist'. 'E-Assist "helps detect threats and operational accidents to assist the driver to detect the situation and alert the driver. There are three e-assist functions contained in the Outlander PHEV is the Adaptive Cruise Control system (ACC), Forward Collision Mitigation System (FCM) and Lane Departure Warning System (LDW). In Japan, the car price is about ¥ 4.297.000.